The name ‘Semi trailer’ is short for semi-lowloader. 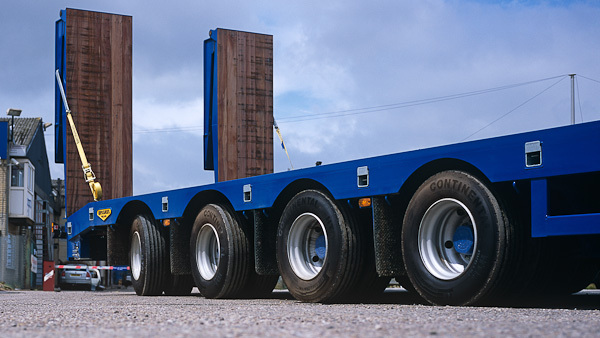 Step frame trailers with hydraulic ramps are not low loaders proper, but have a lower deck height in common with low loaders. The kingpin of the trailer is attached to the underside of the step frame trailer’s upper deck, enabling the trailer to be coupled to the tractor unit’s fifth wheel. The upper deck is built sufficiently high to accommodate the tractor unit. The lower deck of the step frame trailer is built at a lower level than the upper deck, enabling high loads to be moved without the total height of the loaded trailer exceeding the legal limits for normal road transport. The lower deck heights of step frame trailers with hydraulic ramps is generally 0.95m. Step frame trailers with hydraulic ramps often have a beaver tail at both the rear of the trailer and also at the neck of the trailer. Step frame trailers with hydraulic ramps are also fitted with built in pop-up neck ramps or a set of loose neck ramps to enable the loading of wheeled vehicles up on to the top deck of the trailer. The lower deck height of a step frame trailer with hydraulic ramps is wholly above the height of the trailer wheels, giving an uninterrupted flat lower deck. This make the trailer useful for moving a wide range of loads ranging from tractor units and excavators, through to JCB’s, road planning equipment, crushers, access equipment, forklifts, military equipment and vehicles.